How time flies! I can hardly believe that we are already saying good bye to 2017 and are at the end of Term 1. It seems only yesterday that I was welcoming you all to a new school year. As I look back over the term, it's hard to believe how much we have achieved. With each and everyday that passes we see our children grow and develop. 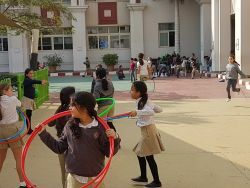 All of the children have become more mature, independent. 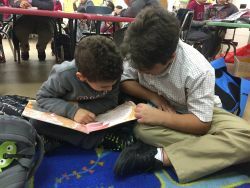 No matter what the report grades say we should always celebrate the efforts our children put into their learning. 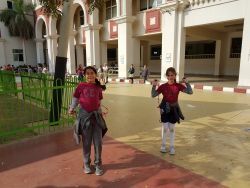 We forget sometimes that for the majority of our students are learning in their second language and they are studying two curriculums (Egyptian Ministry and English National Curriculum) in the same amount of time as students in the UK are just doing one. This makes our children truly amazing! We should always remember this and celebrate their achievements, however large or small. So as 2017 draws to an end, please look back and think about all of the things your children can do today that they couldn't this time last year, you'll be amazed! Listening to some of the children in their values lesson this week they were discussing what they are thankful for, their responses surprised me. I was expecting responses related to possessions; however what I heard was I'm thankful for my teachers, for being at CES and for the friends they have. What reflective children we have. We should all be very proud! I wish you all a safe and enjoyable holiday. I look forward to seeing you all on the 8th January 2018 at 7:55am. When preparing you children for the start of a new year please be aware of the CES uniform policy. • All long hair must be tied back (boys and girls) this lessens the spread of head lice. Please note the class teacher is not responsible for any lost items of clothing. To help return lost items of clothing please ensure that all of your child's school uniform is labelled with their name and class. 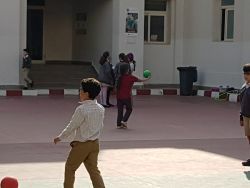 As all of the children will be preparing for their Ministry Exams over the holidays we will not be setting any additional English or Maths homework for the holidays. There will of course be Mathletics and Reading Eggs should you wish to use it. This term KS2 has been looking at ways of expanding the traditional school council where there are a few school reps who do everything to a whole school pupil involvement where all students are encouraged to be an active part of the pupil voice through involvement in a New School Council. 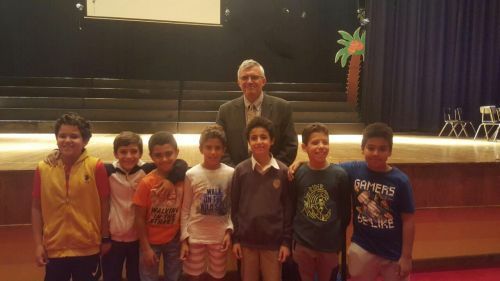 The children were introduced to the idea through assemblies where they were informed of the opportunities to get involved in the running of the school through self elected small groups called 'action teams.' 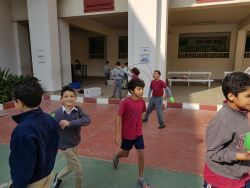 These groups are made up of no more than 6 students who all share an interest or passion for an event, activity or campaign they all want to get involved. 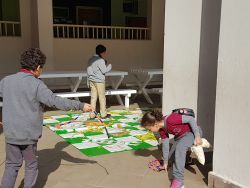 This has created a buzz in the play areas with lots of interest seen in groups of children who have managed to organise themselves and registered their action teams. The action teams range from Book clubs, Anti bullying action team, Anti litter team, Fund raising team, Board games to Sports clubs and Learning action teams. 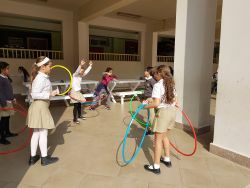 Mr Gumpo has been involved in sponsoring a Playground buddies action team whose aim is to seek ways to engage more students through promoting playground games in the quad area during play and lunch times. 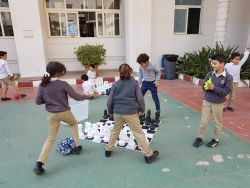 The team has so far been successful in introducing new games to include large snakes and ladders, large chess games, skipping, hoola-hoop games, snap and catch games, construction games and 4 squares. 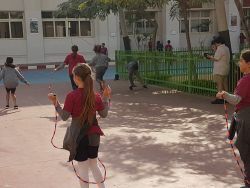 All these games aim to engage students in positive ways and reduce conflicts. 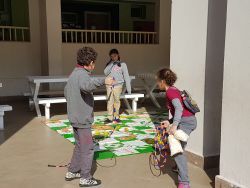 A purposeful designed lockable wooden games cage with easy access designed at school is currently being used to store the equipment. 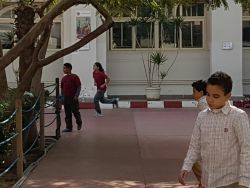 This New School Council model will help more children to get involved, including more students who are unlikely to be engaged by the traditional school council model. 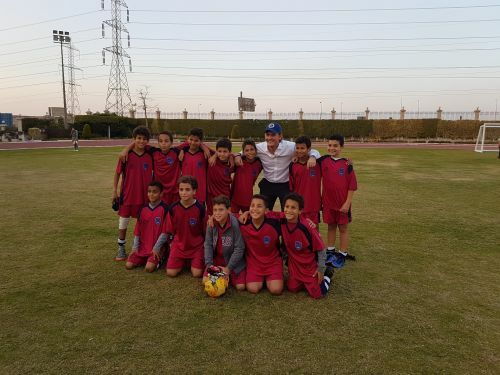 The U11 boys' football team saw enormous success throughout Term 1, maintaining a very impressive unbeaten league record. 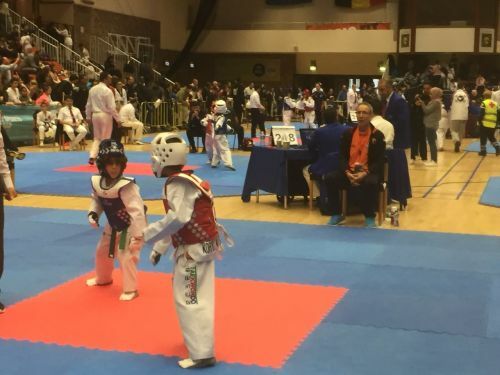 In addition, our very first tournament saw us place 1st. 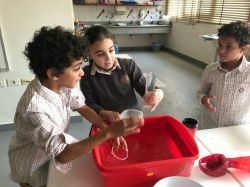 Practical learning in Year 3. 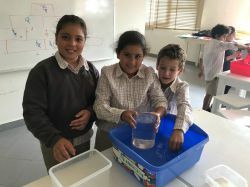 In Numeracy, students learned about Measurement - Length and Capacity. 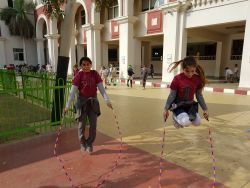 We took our learning outside of our textbooks and into practical lessons. 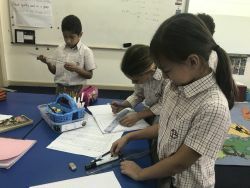 When learning about length students were able to estimate and measure a range of lengths in mm, cm, and m. We used rulers, meter sticks and measuring tapes for our investigations. 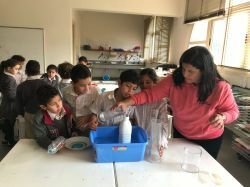 Learning about capacity we decided to get water and measure different measuring cylinders with the capacity of 1 liter. 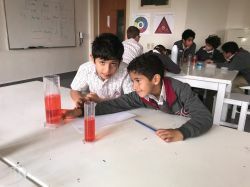 We then found different household containers to estimate and measure the capacity to the nearest 100ml. 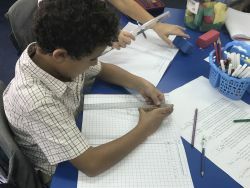 Students are now able to explain what length and capacity is, the units measured and the equipment to measure. 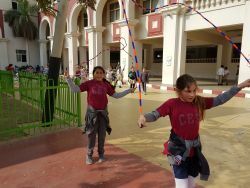 It was exciting in Year 5 during this year's Book Week. 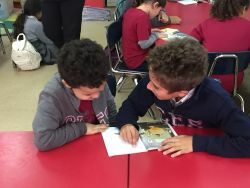 With visits to the Book Fair to purchase MANY copies of the popular novel 'Wonder' and dressing up as our favourite book characters on Thursday, but the highlight for most of us was the opportunity to work with the Year 1 children to do some buddy reading. 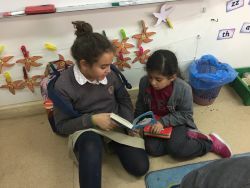 The children commented on how nice it was to read with the younger students and support them with their reading skills. Some children even applied their teaching skills to ask their buddies comprehension questions to check their understanding of the story too! Teachers in the making! 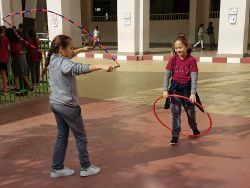 Thanks to all who have been involved in making this Key Stage 2 Book Week a success. 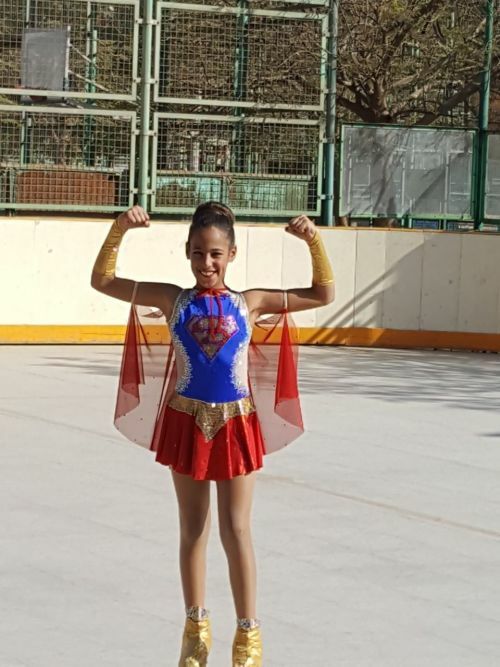 Congratulations to Maryam whom came in 1st place and won the Gold Medal at the First International Artistic Skating Competition in Cairo. 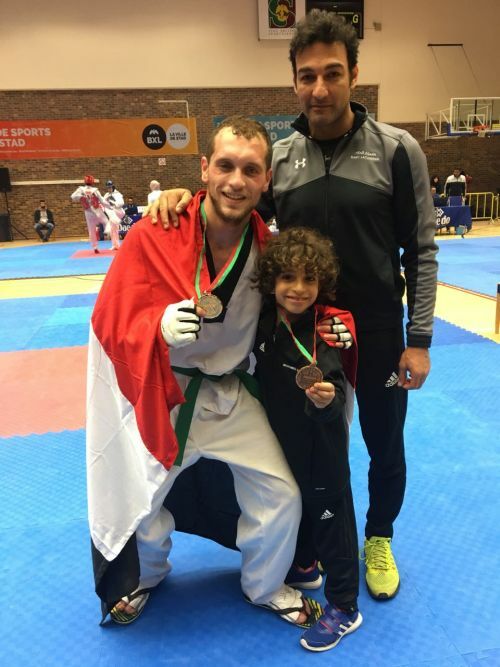 Congratulations to Mohammad Khalid who achieved 3rd place and received the bronze medal in the Indoor Brussels Taekwondo FY 2017. 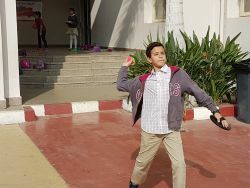 Mohammad travelled to Brussels to represent Egypt in this tournament and was the youngest among a team of another 10 players. 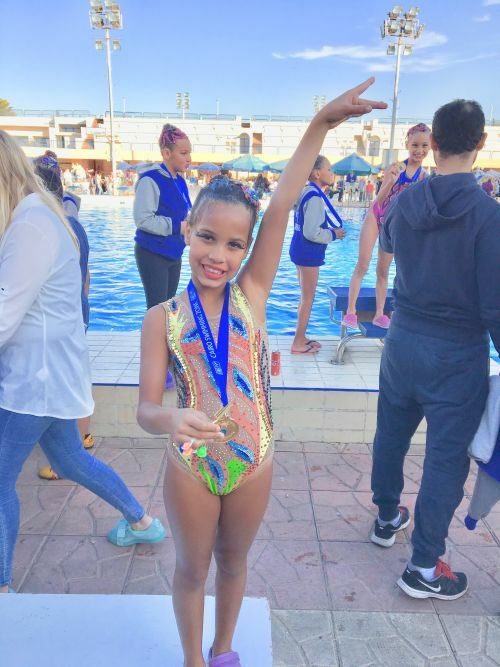 Along with her team, Kenzy won 1st place in the all Egypt Water Ballet Competition within her age group and in the older age group the team came 5th. Congratulations and keep up the hard work.